Ahead of its Geneva motor show debut, the production version of the McLaren P1 GTR track-only weapon has been fully revealed. The monstrous McLaren was first seen at the Pebble Beach Concours d’Elegance last August in design concept form, but the true reality of the 986bhp beast has been fully realised and will cost a cool £1.98 million. McLaren has upgraded the P1’s Instant Power Assist System on the 3.8-litre turbocharged engine to increase power output 789bhp – up from 727bhp) and the electric motor now peaks at 197bhp, which is an additional 21bhp in itself. In all, there is a 83bhp power hike. If you thought the standard P1 was well optimised to punch a hole in the air, the GTR has been extensively revised to push those boundaries even further. The rear wing, for example, is now fixed and sits 400mm above the bodywork, which is 100mm more than the hydraulic adjustable wing on its understudy. At 150mph, that now fixed rear wing now produces a whopping 660kg of downforce to keep the P1 GTR hunkered down on the tarmac, while the Drag Reduction System is also carried over onto this track-only hypercar. Other revised areas on the GTR’s body include an aerodynamic blade running across the lower bodywork to smooth out the airflow and a more aggressive splitter has also been introduced to aid the movement of air around the car. 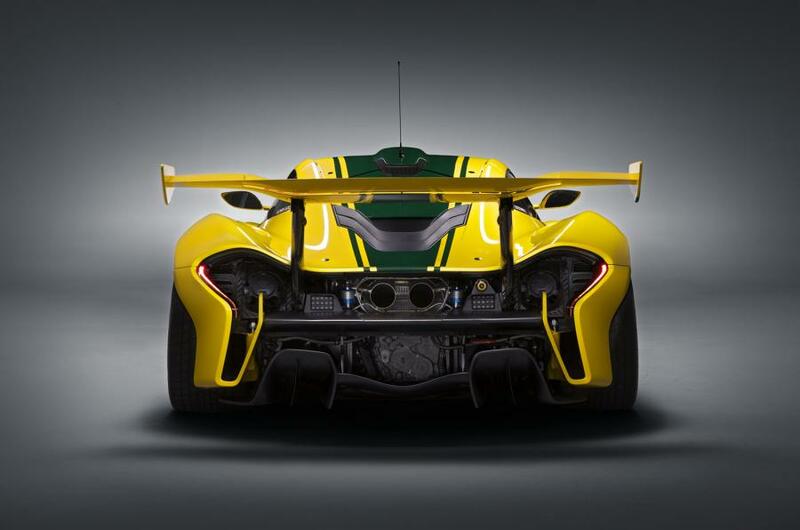 A 50kg weight loss has also been taken out on the P1 GTR, with the use of motorsport-developed polycarbonate for the side window, carbonfibre panels for the roof and engine bay and twin exhaust pipes made from an alloy of Inconel and titanium all helping reduce the mass of the car. The road-illegal nature of the P1 GTR doesn’t stop with the bodywork; McLaren has lowered the GTR by 50mm and is 80mm wider than the normal P1, while its rubber consists of slick Pirelli tyres. 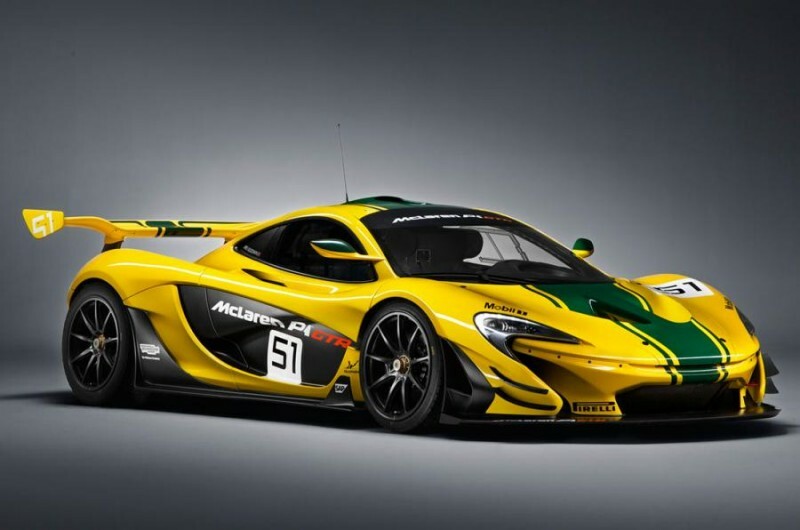 To commemorate the Le Mans podium-finishing McLaren of 1995, the P1 GTR is garnished with the same Harrods-sponsored yellow and green livery of the F1 GTR chassis #06R. Just 375 will be offered to the existing P1 customers and gives them instant entry to the McLaren P1 Driver Programme. This programme isn’t the only element that will compare the P1 GTR to the Ferrari FXX K, with the two cars sharing similar hybrid layouts as their road-going alternatives and will be obvious competitors in this latest round of track-only offerings. However, later this year, there will be a new kid on the block when Aston Martin releases its mystery Vulcan track hypercar to the world. Not much is known about the Gaydon firm’s inaugural fore into this extreme part of the market, but all will be revealed at Geneva in just over a week’s time.